I woke up in the night with the tune “Stand Down Margaret” by The English Beat in my head. I remember checking out one of their records from the Southgate Mall Branch of the Edmonton Public Library, in 1984. There was a cautionary mobile dangling above my head composed of melted vinyl albums, casualties of being left in the car on a hot day. Being able to check this record out and take it home(via the bus, not a car), was a wonderful thing. I didn’t know what the title of the song referred to, or who the Margaret was, just that it was unusual to hear my name in a song. I looked it up today, and it’s former Prime Minister of the United Kingdowm, Margaret Thatcher, and The English Beat are asking her to please stand down, because all they see in their country in the early 1980’s is sorrow. More at my Margarets Pinterest Board. 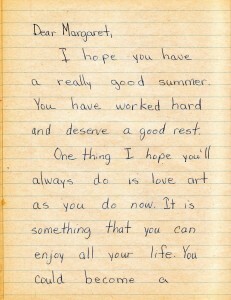 My grade 1 teacher, Mrs. Peggy Juchli, wrote this message at the end of the 1973 school year. I have a memory of Mrs. Juchli encouraging me to make art, but reading her words, when I found this journal in the attic a few weeks ago, was a revelation. Mrs. Juchli introduced me to the Group of Seven, and taught me how to observe the brushstrokes, and all the magic that artists can create with paint. Everyday we would write in our journals, in Edmonton Public Shools Practice Books. My first grade entries begin with crayon drawings and then I began to add words, and Mrs. Juchli would leave comments and answer my questions. My love of drawing continued into grade 2 and 3, because all my entries had illustrations. When in later grades I didn’t have a journal anymore, art was redefined by teachers who wanted me to trace things, and I was not good at tracing. By Grade 7, when art class was an option, it never occurred to me that I could choose to take it. I believed I wasn’t good at art. But I still loved art. I took the bus to the Edmonton Art Gallery in 1982 to see an exhibit of Sybil Andrews‘ Linocuts. 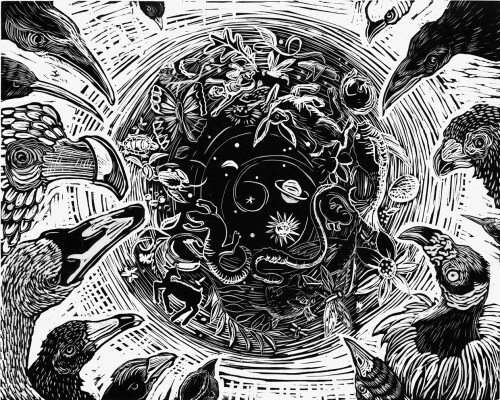 I was 15, and mesmerized by the prints, by yet another way to observe the world. 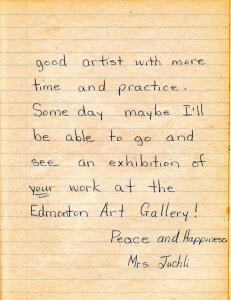 I am grateful that I had Mrs. Juchli’s exhortation to love art, and enjoy it as I did then. It was over 30 years before I searched for an art medium that I could practice, and with it has come peace and happiness. Thank you Mrs. Juchli. Who would you like to thank for encouragement? Searching for a Margaret for Margaret Monday, Stratoz suggested that I look for something related to Christmas, and Margaret Calkin James(1895-1985)appeared. She was part of the everyday visual landscape because of her work for London Transport and the Underground. 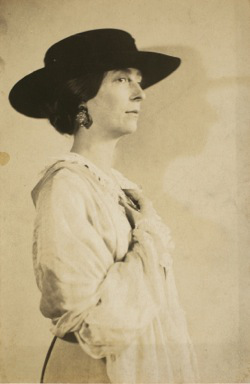 Margaret Calkin went to art school, winning an award for her calligraphy, and in 1920, started the Rainbow Workshops in Bloomsbury, in the tradition of the Omega Workshops, where she made posters, prints, book papers, and fabric. 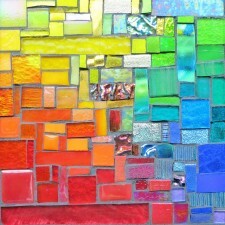 The rainbow for the Workshops sign is mosaic-like in it’s rectangled arrangement. I love the muted tones and the Noah’s Ark floating on zigzagged waves. 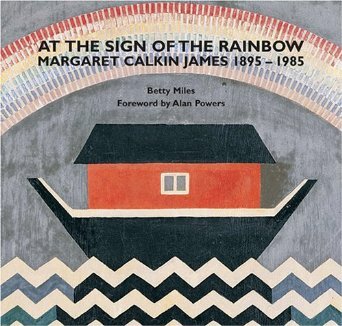 At the Sign of the Rainbow: Margaret Calkin James. She married in 1922, and worked out of a studio in her home, including this festive “greetings telegram form” for the Post Office in 1935. 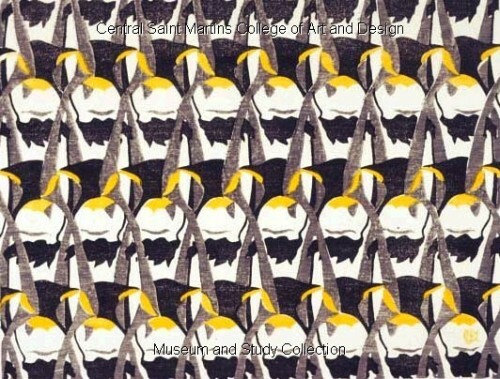 She designed for publishers and textiles, and the penguins linoprint has some very cool repeating interconnections. Penguins Linoprint by Margaret Calkins James, 1963. In 1969, Margaret Calkin James suffered a stroke, which paralyzed her right arm and impeded her speech, and in a desire to keep creating, started making wool embroidery patterns. Margaret’s daughter Elizabeth Argent spent many years arranging exhibitions of her mother’s work to ensure a legacy. Dancing around the Bride: Cage, Cunningham, Johns, Rauschenberg, and Duchamp at the Philadelphia Museum of Art through January 21, 2013. Stratoz and I took a trip to the Philadelphia Art Museum, and saw the Dancing around the Bride exhibit, about 4 artists who enjoyed working with each other, inspiring each other and playing with their art forms of music, dance and visual art. 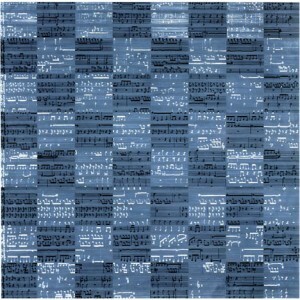 I was intrigued by the room of art inspired by chess, and the John Cage work made of bits of music notation in a light-dark chess pattern. Reading the tag, I discovered that for many years the general assumption was that the music was not “playable” but purely visual, but pianist Margaret Leng Tan transcribed it into a score. She deciphered the original scraps of paper, like making an aural collage, or cryptography of assumptions. Nelder-Mead optimization given 9 points (6 gray-scale and r,g,b) via Josh Siegel on Flickr. 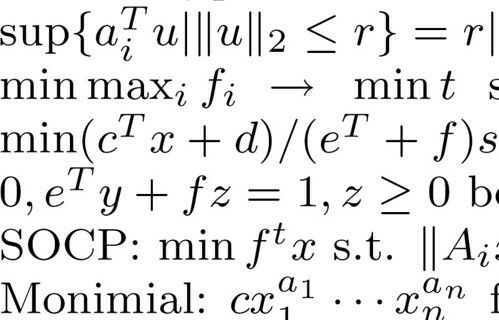 Convex Optimization Cheat Sheet via John Chilton on Flickr. Useful observations about growing in a job, and dealing with stereotypes in math and computing science, and would apply to other fields. 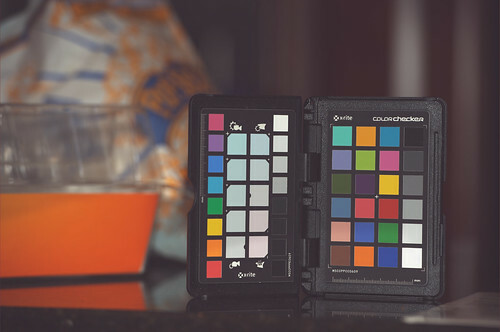 Wright mentions working with Nelder-Mead method, and I did a search in Flickr and found the cool photo above, with colors. Apparently, optimization can help with calibrating colors on different screens. How Hard Can it Be? Lecture by Margaret Wright. I understood much of the English parts of this, and nothing of the formulas, but it was an interesting discussion of cryptography among other practical problems. Margaret Watkins(1884-1969) was born in Hamilton, Ontario as “Meta Gladys” and transformed into a Margaret. Often Margaret’s start out with the name but become Peggy, Marge, Greta or Maggie. Margaret Watkins left Canada when she was 24, and worked at the Roycroft Craft Community in East Aurora, NY. I was happy to find that connection, because I spent my 40th birthday at the Roycroft Inn. She moved to New York City, studied photography with Clarence White, and then taught at White’s school, including photographers such as (another)Margaret Bourke White. 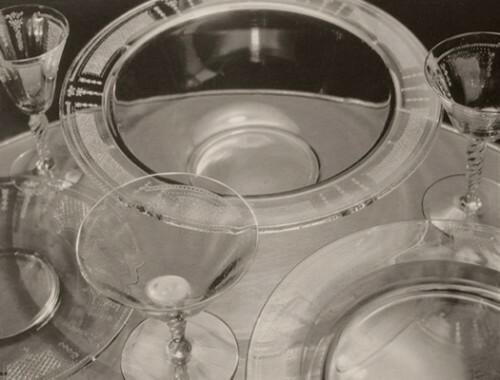 Watkins created still life settings of domestic objects in her Greenwich Village apartment and many of her photographs were featured in magazines and in advertising. In 1968, Joseph Mulholland, a journalist, moved in across the street and he and Margaret because friends. She handed him a box and told him not to open it until after her death, and when she died in 1969, Mulholland was amazed to discover photos from her studio, and magazines; he was amazed because she never mentioned her past life as a photographer. He found her trunks still packed for a return trip to NY, and many more photos in her house, and has devoted 40 years to showing her work.I take heart in Joseph Mulholland’s championing of Margaret Watkins’ work. It’s as if her life was embedded in film negatives, lost in a drawer for decades, and then discovered by a friend, developed and brought back to life. 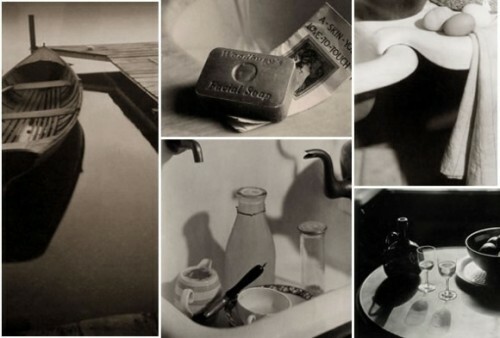 Margaret Watkins made a name for herself during the 1920s in the world of commercial photography with the staging of everyday objects, such as soap, gloves and a pack of cigarettes, making them attractive and desirable. This exhibition of some 90 photographs will be the first retrospective of this important Canadian Modernist photographer. Looking for Margarets has led to me to so many interesting women, but I found Margaret Peot because of looking for images about the Alexander Technique on Pinterest, and she had an Alexander board. 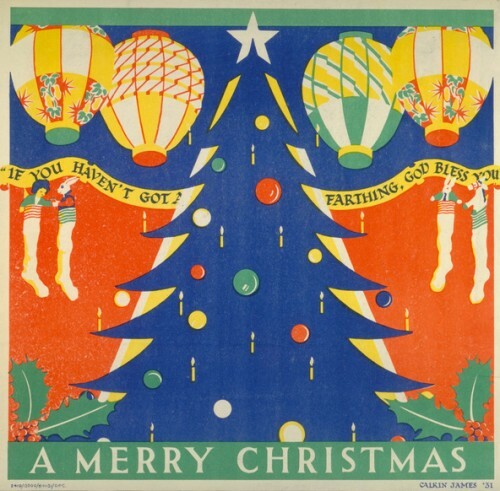 Fortunately for me, Margaret Peot also had a board of her woodcut art, and in looking for more about her, I also discovered she works as a Costume Painter at Parson-Meares, LTD, for Broadway shows. Such awesomeness to know there is such a job as painting costumes! Check the costume fabulousness on her site, from mermaid scales for Bette Midler, a suit of flames for David Byrne, and fur for Flying monkeys. Margaret Peot is also an author of books about making alternative journals and cards, ink blot art, and The Successful Artist’s Career Guide. In an interview on ArtistsNetworkTV, she mentions her mother’s recollection that Margaret would say she was going to be an artist until she was 40, and then write books, and this has come true. More Margarets on my Margarets Pinterest Board. Margaret De Patta was my first “Margaret Monday” feature and I’m revisiting her because the Space-Light-Structure: The Jewelry of Margaret De Patta is at the Museum of Art and Design through September 23rd, 2012. 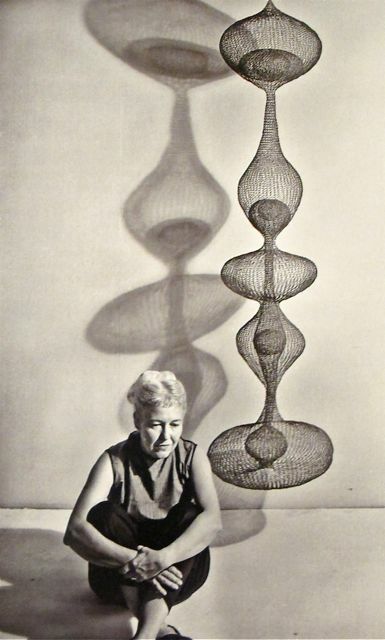 MONDOBLOGO wrote an exuberant post about Margaret De Patta and how her previous blog post was about wire sculptor Ruth Asawa, and then she found a photo of the DePatta in front of her own Asawa piece. 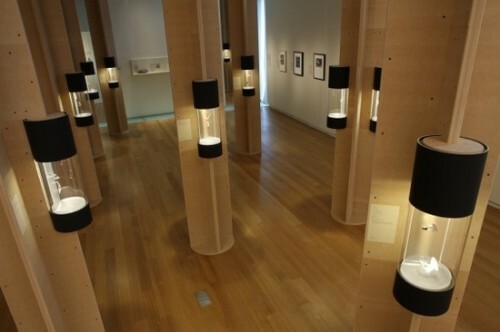 I love connections like this, and MONDOBLOGO had a photo of Asawa’s wedding ring, designed by Buckminster Fuller, another favorite of mine. Bella Neyman has an illuminating interview with Ursula Ilse-Neuman, curator of the Margaret De Patta Exhibit at the Museum of Arts and Design, about the sculptural quality of De Patta’s designs, and her use of “opticuts“(intricate faceting of stones to show their interiors with lapidary Francis Sperisen), and one of these she traded for the Ruth Asawa wire sculpture. Photo courtesy of Ed Watkins. Rupert Deese’s design for Margaret De Patta’s work at MAD. 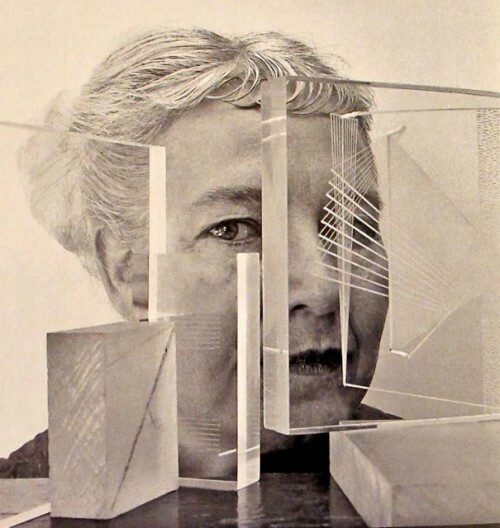 Moholy-Nagy’s work definitely recognizes that everything is in flux, and therefore, flux should be recognized. And when somebody’s wearing jewelry, it’s a performance. You know, your earrings are fairly static, but nonetheless, they’re there, they move when you move. Ilse-Neuman sums this up in the title of her article The Transcendent Jewelry of Margaret De Patta: Vision in Motion. Vision in Motion. 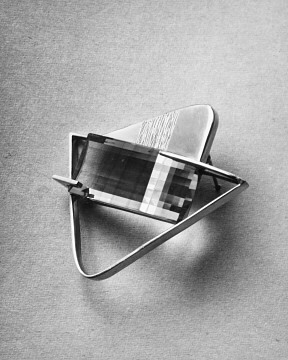 De Patta brooch with a Sperisen double lens “opti-cut” smoky quartz. When observed by a spectator, the stone creates a “see through” effect that distorts and gives the illusion of movement to the chased decorated surface behind the gemstone. Photo by Margaret De Patta. Space-Light-Structure at: Museum of Art and Design, New York City, June 5th, 2012-September 23rd, 2012, Space-Light-Structure: The Jewelry of Margaret De Patta. More photos at my Margarets Pinterest Board. I was born in Albuquerque, where my father was going to the University of New Mexico, but we moved to Canada when I was a baby. We were probably the only family in Edmonton with a subscription to New Mexico magazine. When I was a girl, my parents bought several pieces of pottery from New Mexico. The pots were polished black with matte designs emerging from the gleam. I was fascinated by the contrast of surfaces, of shiny and porous, how the black could be of two natures. 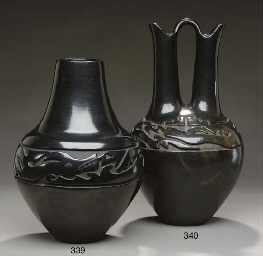 Margaret Tafoya, Santa Clara Blackware from Christie’s Catalog. I came across the carved and polished blackware of Tewa artist Margaret Tafoya(1904-2001),from the Santa Clara Pueblo in NM. 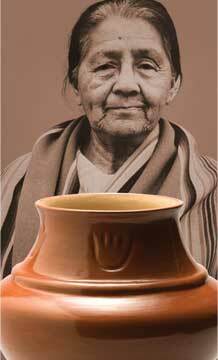 She was from a family of potters, and learned from her parents, Sarafina and Geronimo Tafoya. 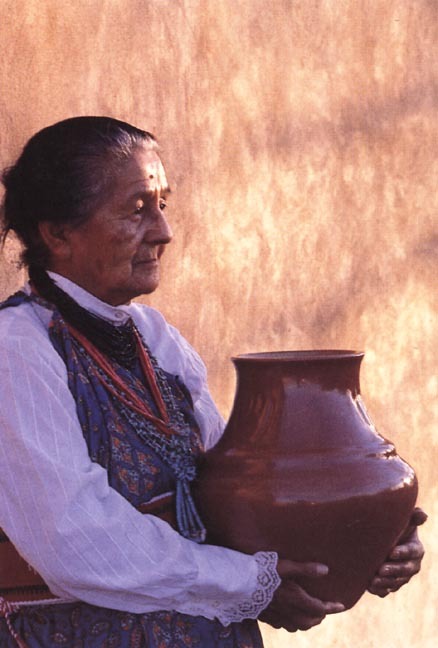 Margaret married Alcario Tafoya(who had the same last name as she did), and together they also worked together making and selling pottery to support their family of 13 children. Many of these children have gone on to make their own pottery. In 1984, Margaret Tafoya won an NEA Heritage Fellowship in honor of her work. She dug the clay at the Pueblo, and used the traditional coil method, and burnishing the surface with polishing stones. I never knew there was such a thing as a Music Supervisor until I searched for a Margaret whose last name started with Y, and found Margaret Yen. Music Supervisors pull together musicians, composers, arrangers, songwriters, performers and basically anyone else who is associated with music on film, tv, advertising and videogames, and helps set the tone of the work, combining sound and vision. 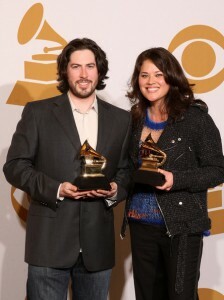 Margaret Yen won a Grammy for her Music Supervision of Juno, and is quoted by Ruth Gerson in an article as saying that one of the perks of her job is being able to license music that would otherwise go unheard. You’ve most likely heard the effects of Margaret Yen, but just didn’t know it!